"He's not an actor. He's a hoofer." It's a shame James Cagney didn't make more musicals. And it's doubly disappointing the ones he did make are much like Something to Sing About�fair-to-middling efforts with second-rate songs, aimless direction, and little stylistic sense. Although the legendary tough guy lacked the grace of Fred Astaire and the athleticism of Gene Kelly, he was still a snappy little solo dancer, light on his feet and adept at intricate steps. Unfortunately, Cagney's pugnacious gangster persona raked in so much money, his Warner Bros. bosses rarely permitted him to expand his horizons. Yet why the studio never capitalized on his two landmark musical appearances (in the 1933 Busby Berkeley extravaganza Footlight Parade and his Oscar�-winning turn as George M. Cohan in 1942's Yankee Doodle Dandy) remains a mystery. So don't credit the brothers Warner for casting Cagney in Something to Sing About. Au contraire. Victor Schertzinger's amiable Hollywood satire was produced by the fledgling (and soon-to-be defunct) Grand National Pictures, a low-budget outfit where Cagney cooled his heels after winning a lawsuit that cancelled his Warner contract. Although the disgruntled actor could have defected to any of the major studios, Grand National submitted the only offer granting Cagney both the creative control he craved and lucrative salary he demanded. The brief union produced only a pair of mediocre films, before Cagney mended fences with Warner and triumphantly returned to his "alma mater." Something to Sing About is the better of Cagney's two Grand National efforts, but that's not saying a whole lot. The studio's shoestring finances prohibited the hiring of any big-name talent to join Cagney, and made splurging on splashy sets and production numbers impossible. Yet despite such hindrances, the movie remains an entertaining�if silly and dated�romp, made watchable by its star's considerable magnetism. Cagney plays bandleader Terry Rooney, who reluctantly shuffles off to Hollywood after his agent negotiates a film deal. Once in Tinseltown, Terry alienates the studio's makeover team by resisting their efforts to transform him into a high-toned prettyboy, and grumbles about his director's noncommittal attitude toward his work. What Terry doesn't know is that chief executive B.O. Regan (Gene Lockhart) wants Terry's ego kept in check, so he issues a secret edict forbidding any employee to praise the actor's performance. Terry toils on, but begins to feel unappreciated and used. When the picture wraps, he elopes with his old flame Rita (Evelyn Daw) and flees Hollywood. The two spend an isolated honeymoon on the South Seas, during which time the studio releases his picture to tremendous popular acclaim. Upon Terry's return to California, Regan frantically tries to sign him to a long-term contract. Seduced by his newfound stardom, Terry capitulates, but notices a fine-print stipulation requiring him to remain single to protect his heartthrob status. To seal the deal, Rita graciously agrees to keep their marriage a secret and masquerade as Terry's personal secretary, but the pressures of the deception, Terry's hefty professional commitments, and the demands of his prima donna co-star (Mona Barrie) jeopardize their relationship. Something to Sing About wittily mirrors Cagney's frustrations with the Hollywood rat race and pokes fun at the studio system as a whole. Production methods, acting styles, pompous executives, overzealous agents, and the era's intense fandemonium all provide choice fodder for the film's writers. In fact, Terry's amusing sessions with an impatient and demanding vocal coach so closely resemble similar sequences in Singin' in the Rain, one wonders whether they inspired portions of that classic musical. Cagney is smooth as silk, acting with a comfortable naturalism his usual high-voltage portrayals often lack. During the far-too-few dance sequences, he seems to be having a ball, obviously relishing the opportunity to strut his terpsichorean stuff before the cameras. Watching him flawlessly perform complicated steps in a bouncy, marionette style makes one pine for more Cagney musicals and rue the lack thereof. Heralded as a great vocal discovery, Daw (in her film debut) sings most of the score in a pleasant yet thin soprano reminiscent of Jeanette MacDonald. Unfortunately, she lacks the personality and dramatic talent to stand up to Cagney, and never gained public favor. A Hollywood casualty, she made only one more film before abandoning the screen a year later. William Frawley (as a pushy press agent), Barrie, and the always delightful Lockhart lend excellent support and welcome flair to the production. Something to Sing About brightly lampoons a host of film industry foibles, and gives Cagney the refreshing opportunity to brandish tap shoes instead of artillery. His tip-top dancing adds interest to this standard musical, but isn't enough to make it more than a fluffy, forgettable diversion. Image Transfer Review: For a 65-year-old film with no connection to a major studio, Something to Sing About has somehow survived its time in the vault looking none the worse for wear. The miraculously clean black-and-white transfer enjoys good clarity, fair gray level variance, and decent contrast. Grain is present, but not distracting, and while the source print exhibits some expected age-related defects�including nicks and spots (most noticeable near reel changes), occasional white vertical lines, and a few missed frames�such flaws only sporadically mar the image. "Orphan" films often look horrendous, but Something to Sing About is a glorious exception. Audio Transfer Review: The original mono soundtrack ain't half bad either. A fair amount of hiss is audible, and a few pops and crackles intrude, but the imperfections never detract from one's enjoyment of the film. Dialogue is always clear and comprehendible, and though the music sounds a bit flat, no distortion exists, not even during Daw's high notes. Extras Review: The film's original trailer is the only extra offered, although it's really not a trailer at all. The brief, one-minute snippet totally ignores Cagney, concentrating instead on director Schertzinger's new musical discovery Evelyn Daw, who, after a brief introduction, sings a few bars from the movie's title tune. 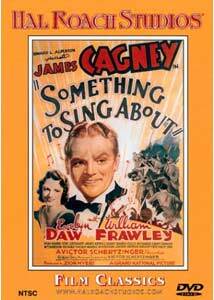 Something to Sing About is nothing to shout about, but it's a pleasant, clever musical distinguished by the fancy footwork of James Cagney. Image offers up a remarkably clean transfer, but only diehard fans of classic film will sing the praises of this lightweight antique.